A Room Air Conditioner is a stand-alone unit which provides cool air to a room or area of your home. Typically a Room Air Conditioner mounts in a window, but there are also models that sit on the floor. Room air conditioners can be used to cool specific spaces. They will also remove humidity from the air, thus making the room feel more comfortable for the same temperature. See manufacturer's recommendations for the size unit needed to cool the space desired. A Room Air Conditioner is different than Central Air Conditioning, which has ductwork to provide cooling for all or most of your home. 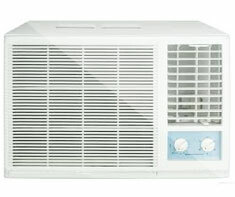 A Room Air Conditioner is also different than a Room Humidifier or a Room Dehumidifier. Central Air Conditioning, Ceiling Fans, Dehumidifier and Humidifier. Shown in the 'Routine Care' section are the recommended routine maintenance tasks for your room air conditioner. The 'Q & A' section shows answers to common questions. And the 'Articles' section provides helpful articles about your room air conditioner. We hope you enjoy our new free app and newsletter! It is a great resource for new and experienced homeowners, it helps you keep track of the little things before they become big things! We appreciate your kind attention and thank you for the opportunity to serve! Feel free to share with family & friends! There are no routine care tasks for this feature.